In June, Pinterest rolled out Buyable Pins that let retailers drive sales straight from their posts. Now, it's adding three new e-commerce companies—Magento, IBM Commerce and Bigcommerce—to power 60 million pins, up from the 30 million that initially launched. Pinterest reports that the shopping pins have been bringing in new customers that brands might not have found otherwise—although it should be noted that Buyable Pins are not built into Pinterest's ads. Washington-based apparel brand Spool No. 72, for example, claims that 84 percent of its Pinterest shoppers are new shoppers. "If you think of Pinterest as a social platform—which we don't—you might expect that brands would be selling on Pinterest to their followers," said Michael Yamartino, head of commerce at Pinterest. "Since we're a broader discovery service than that, when you enable buyable pins, you're actually selling to all sorts of people who have never made a connection to your brand before. It's really more about the content than the actual product you're selling." Bloomingdale's, Steven Alan and DVF are new retailers in the program who will zero in on Pinterest's shopping-minded users to drive holiday conversions. 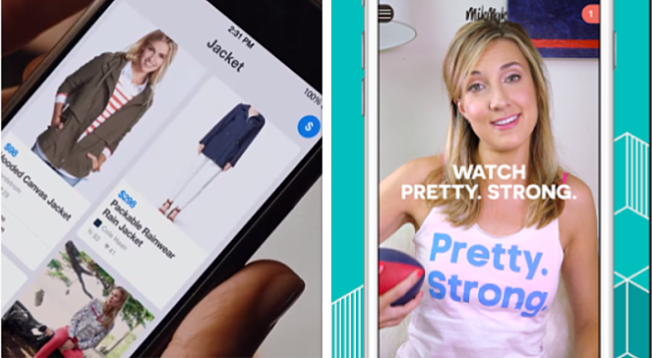 Meanwhile, shopping app MikMak today launches shoppable infomerical-like ads for brands such as GE, American Express, Oxygen and Mondelez-owned Swedish Fish. Since launching in June, MikMak has taken on about 200 small brands looking to peddle their goods, and it's now opening up to larger brands in the form of paid ads, said founder and CEO Rachel Tipograph. Tipograph is the former global director of digital and social media at Gap. "Given my time at Gap, I knew that our model would have to evolve to work with larger companies," Tipograph said. "The way we decided to do that was create this program called Blank Presents where big brands become executive producers at MikMak." Here's how it works: Brands pay MikMak to make a branded video, similar to the content BuzzFeed cranks out for advertisers. Each shoppable web series is marked as sponsored in the app's feed of 30-second videos that is refreshed with new content every day. Advertisers can also embed the video player into their own websites. For example, GE is sponsoring a series hosted by Broad City's Eliot Glazer to promote the technology giant's lightbulbs. And Oxygen is plugging its new football-themed docu-series "Pretty. Strong" with video ads that sell fitness gear. There's sure to be a bevy of other social commerce offerings in the works for retailers and brands in the coming months, and it will be a space worth watching during the holidays.